Check what opportunities ProTrainUp gives you. These modules are available in all types of licenses. 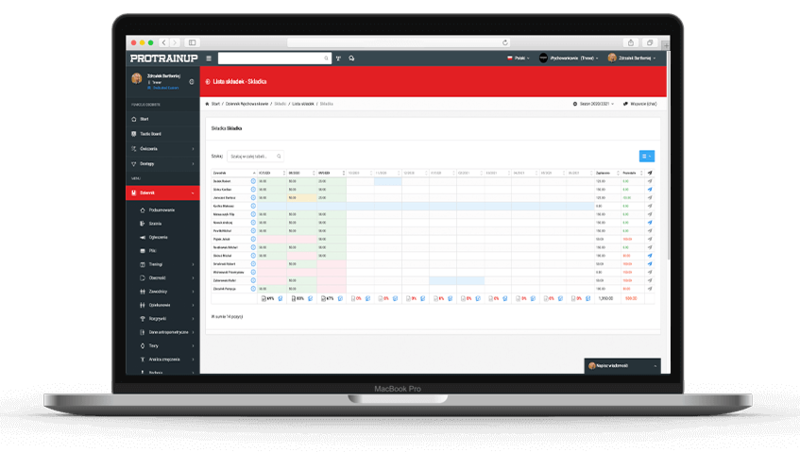 Thanks to the ProTrainUp systems, the Trainer gains a fantastic statistical tool that integrates both quantitative and qualitative data in one place, in the form of comments assigned to training or match data. The club receives a tool for continuous monitoring of coaching work and creating an internal club training system. Currently, this is done on the basis of cursory paper journals, and the training system is often not systematized or does not exist at all. The athlete can observe how he is doing in training, what he should improve and in which elements he has already achieved good results. Parents of young players can have an insight into the sports results of their children. 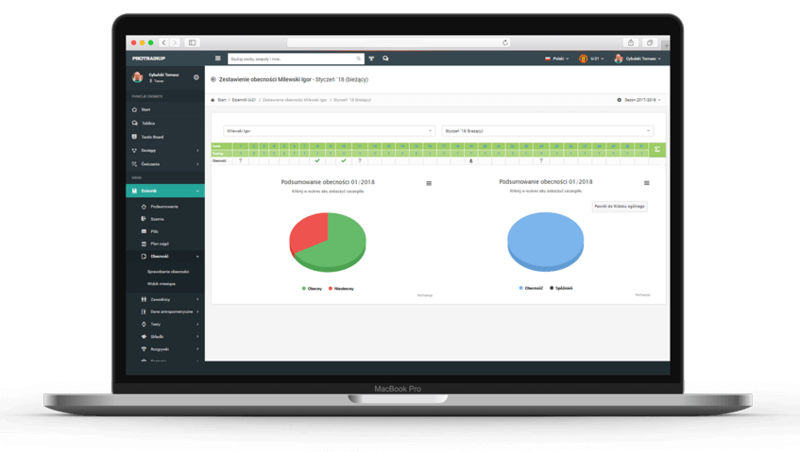 They can also check if they regularly attend their team`s training and even see what the status of paid contributions looks like. Details of attendance may also prove useful in the settlement of contributions or scholarships for players. Communication in the form of chat and private messages will certainly help you in the flow of information between players on the team. 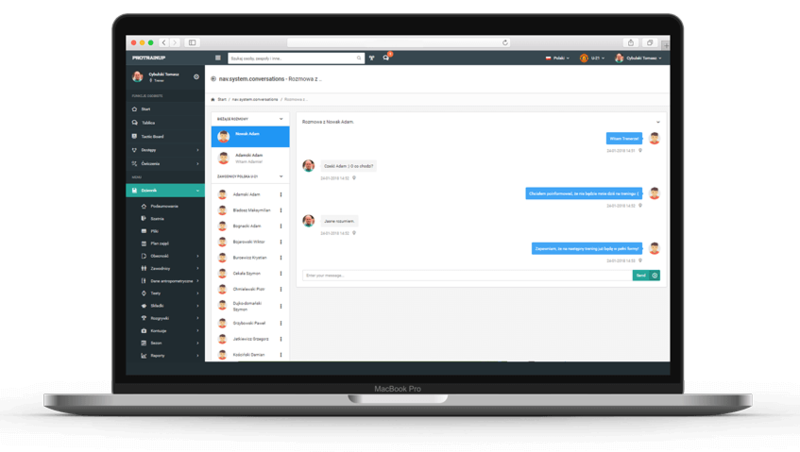 The ProTrainUp messenger has been created based on the best solutions of this type and does not differ in functionality and reliability from popular social networking sites. 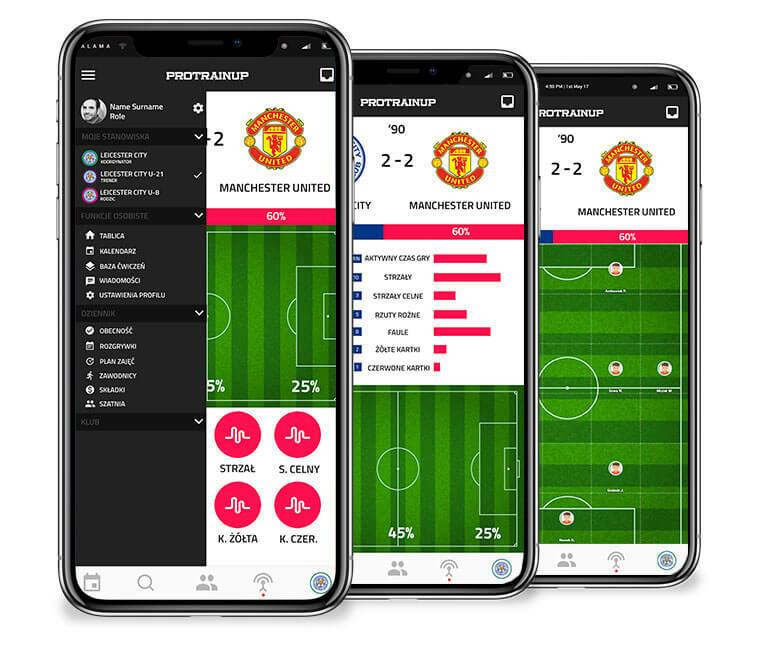 Also, it is the first messanger on the market, implemented on a sport platform, which also allows you to communicate with the player`s parents. Create your own exercise base. Both trainers and coordinators have the opportunity to create bases of exercises and a training model. 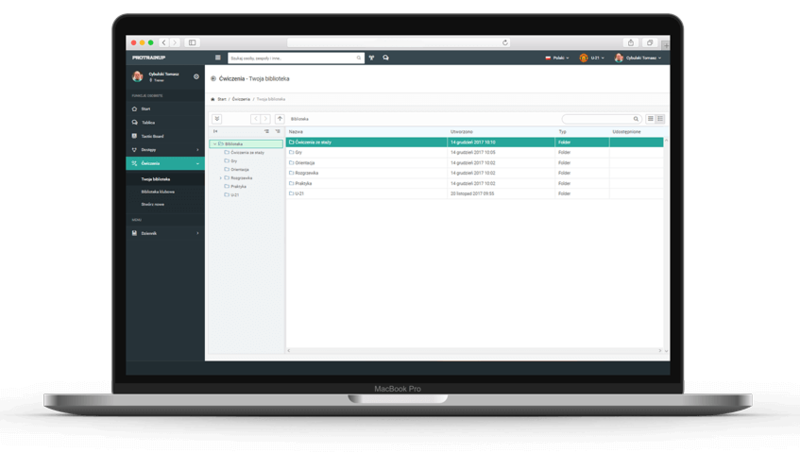 The database gives you unlimited possibilities of categorizing exercises, thanks to the options of creating folders and subfolders. The created exercises can be easly shared to the club base, thanks to it, you can quickly build a full club database, based on the age category, training type or any other division scheme. 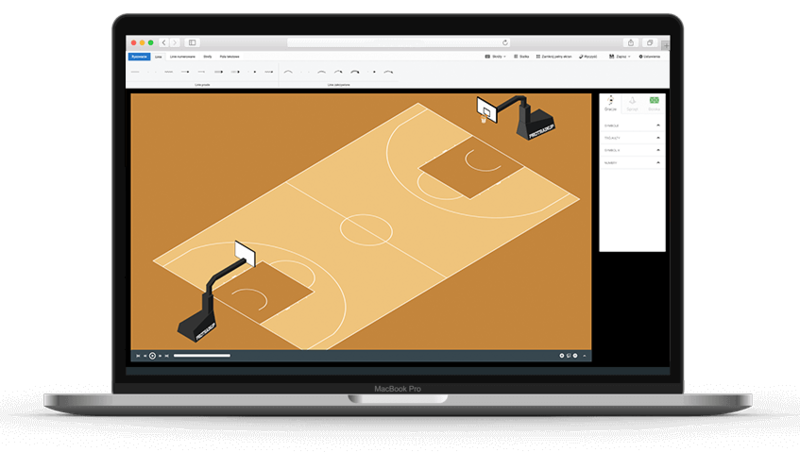 The drag-and-drop PDF creator is an innovative tool that will change the work of a modern trainer. Even today, creating training outlines was a tedious and time-consuming job. Thanks to the ProTrainUp service creator, creating such an outline will take you just a few minutes. The convenient addition of descriptions and the simple addition of graphics to individual parts of the tactical or training draft makes working with our tool a pure pleasure for you. The virtual cloakroom gives football coaches practically unattainable the opportunity to gather the entire team in one virtual room, in our virtual locker room. There can be a daily pre-training briefing, after which players can prepare themselves tactically for training or a match, or plan to allocate energy resources. 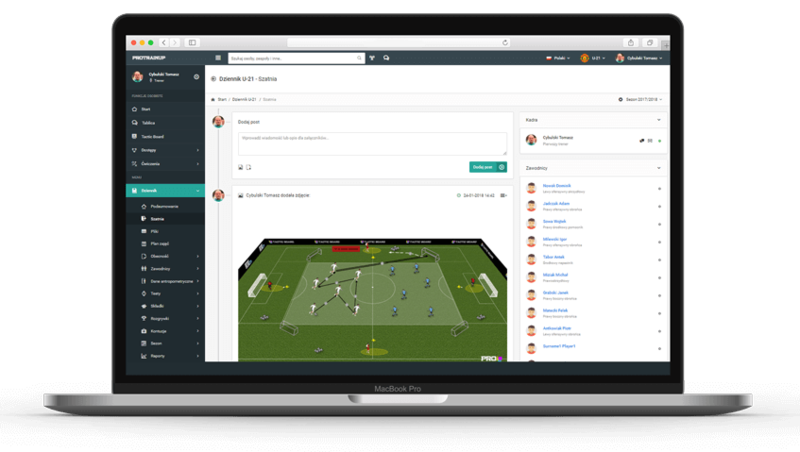 The virtual locker-room also allows you to save valuable training time needed for every explanation of the new game schemes. Thanks to the virtual locker-room, the trainer can present these schemes during our e-tactical briefing. Thanks to the communicator players can immediately ask questions to the presented content, which saves time, improve the flow of information on the line trainer - player, and in effect can improve sports results. Similarly, a club board works, to which all trainers and coordinators working in a given club have access. The mobile application has been prepared for two systems: IOS and Android. 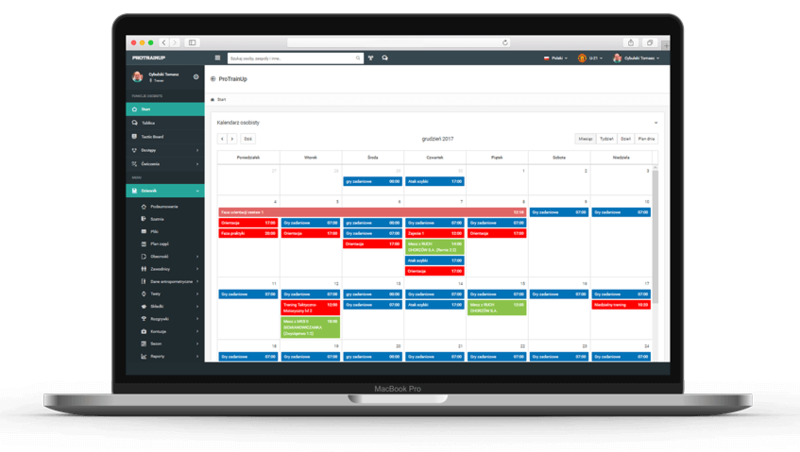 In addition to basic functions such as presence checking, event calendar preview, league table preview and schedule, it also allows you to communicate with other system users. Through the mobile application, we can also follow the LIVE relationships of matches of our teams. The application is also a fantastic notification tool for players, parents and coaches. Notifications may concern: new information in the locker-room, a new event on the calendar, changes in the training hours, appointments for the match or overdue contributions. Thanks to the application, we eliminate additional costs such as paid text messages. 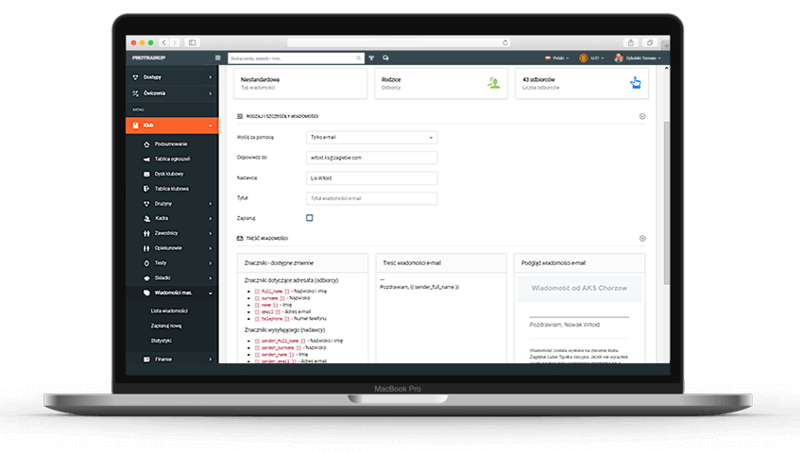 Artificial intelligence in ProTrainUp will solve problems with premium accounting. 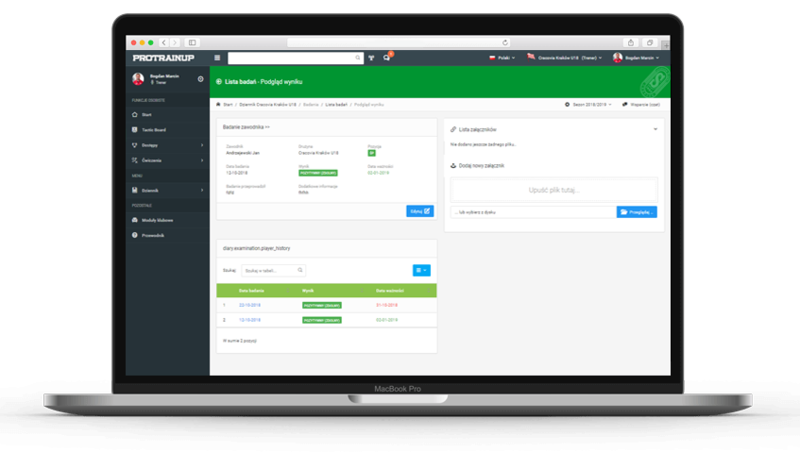 Without any changes in the procedures, you can implement half-automatic contributions service in your academy based on the import of a bank file. Just upload the CSV file generated from your bank, and the system will automatically try to determine the relevant transfers and assign them to the appropriate players. If the names contain names and surnames, the correctness of the assignment will be even 90%. Also without a valid title, some transfers will be automatically adjusted based on proprietary algorithms. Regardless of using the import module, it is possible to run parallel with the manual module or automation using DotPay system (this option works best when all parents are they already have access to the system). 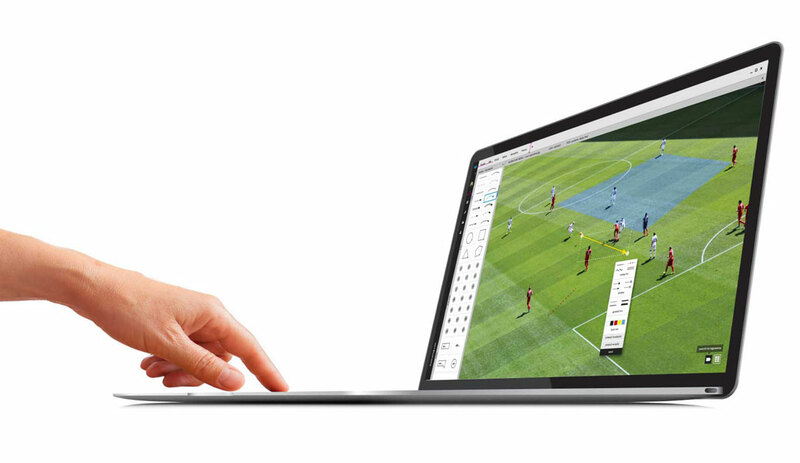 The ability to upload and share documents in a club or academy is another opportunity offered by the ProTrainUp tool. Both the coordinator and all trainers working in the club can upload various types of files, ranging from xls and doc to pdf, ending with graphic files and multimedia presentations. Thanks to this, trainers will have all the important files in one place. The order among files and documents will no longer be a problem. 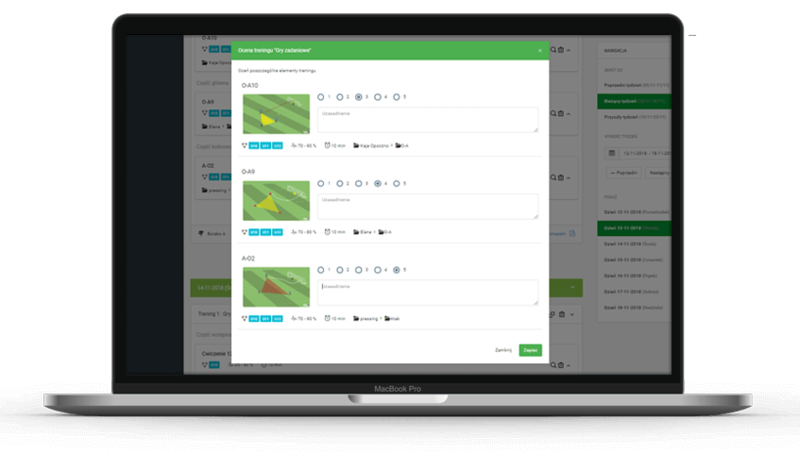 The ability to create your own observation forms and subsequent evaluation of selected attributes of the observed player means that you can quickly define, examine, save and select the optimal player for your team. This module is also great for periodic evaluations of players. 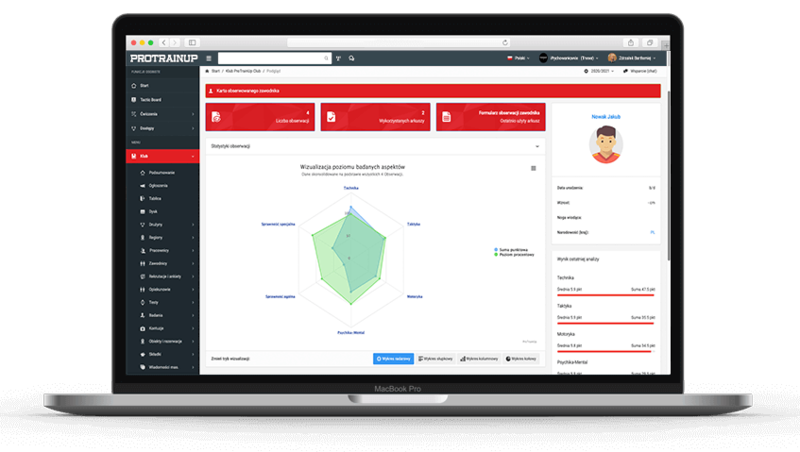 Thanks to the observation module, you will create detailed evaluation profiles for each player in the club. The ability to print the created observation card, as well as the ability to download a ready PDF report, makes this module meet the expectations of even the most demanding users. 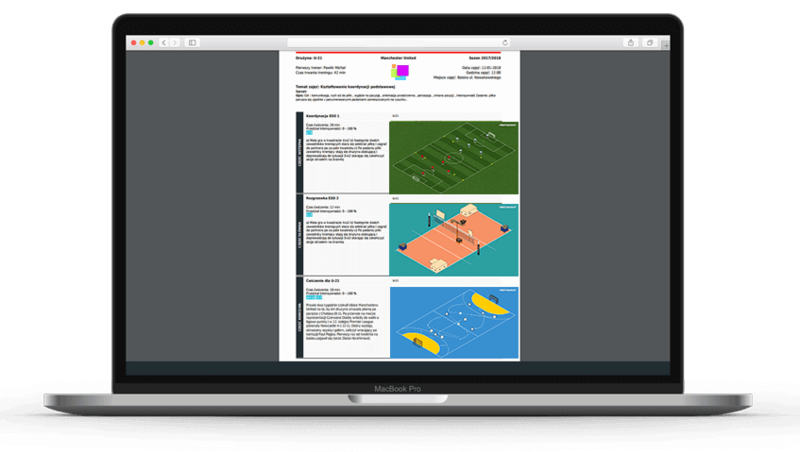 This module allows you to assess the degree and quality of the exercises that you have prepared for the players. A comfortable view of the assessment, showing the exercise schedule, the evaluation field and the place for the comment, makes it possible to assess whether the chosen level of complexity and intensity is appropriate for the group with which you train. Due to detailed reports, the system will share your ratings and opinions due to the category of exercises. Thanks to the medical examination module, you will quickly complete the player`s profile with detailed information about the expiration date of medical examinations. 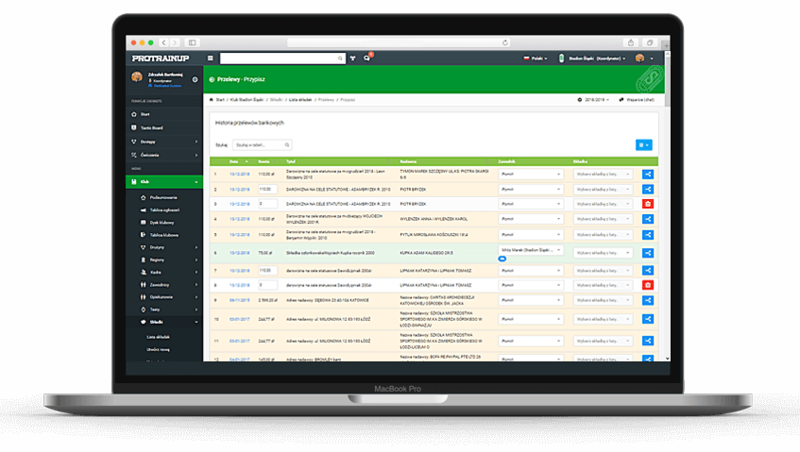 In addition, for each entry, you will be able to add a doctor`s verdict and attach a file with a document, opinion or other important information. By using this module, you and your player will never miss the expiration date of medical examinations. The system clearly marks the approaching end of validity of medical examinations. Thanks to the integration of ProTrainUp with the quick payment system - DotPay, the club gains an excellent tool that will significantly facilitate the accounting work in the academy. By logging in to your account, the parent will have access to the balance of contributions. From this place, he will be able to pay overdue contributions or pay forwards. Parent after choosing the option - pay, will be redirected to the bank`s choice page. After logging in to your bank account, he will be able to make a transfer with a single click, whose data will be automatically completed. If the payment is made through the ProTrainUp via DotPay system, in the contribution module, the contributions will be automatically marked as paid. The financial module allows you to control player`s contributions. 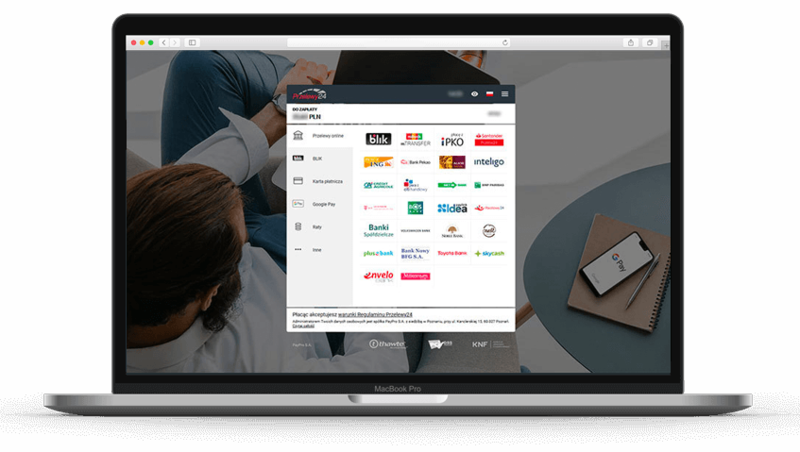 The system allows you to enter both monthly and one-time contributions. Thanks to this, it will be possible to control the balance of the collected contributions and to inform the players and parents of any arrears. The information will be sent as an alert to the player`s and the parent`s account. 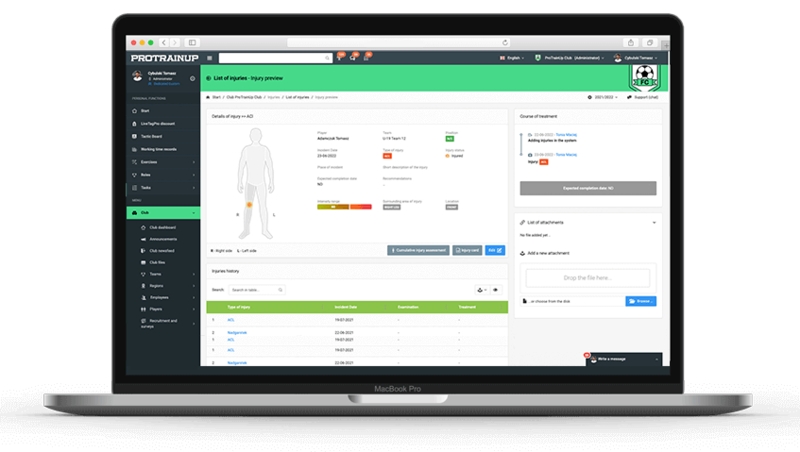 The medical module allows you to record the injury of all competitors in our academy. Giving access to the physiotherapist system or the club doctor, we obtain an extremely useful module, in which we will quickly find information about the course of the athlete`s injury, his injuries or get access to files related to the injury. Live Score, from junior league matches, is a feature that can not be found on the internet today. The ProTrainUp system together with the ProTrainUp Lite mobile application will give this opportunity. Thanks to this functionality, both the board and all parents of the playing team will receive notifications of important match events in real time. 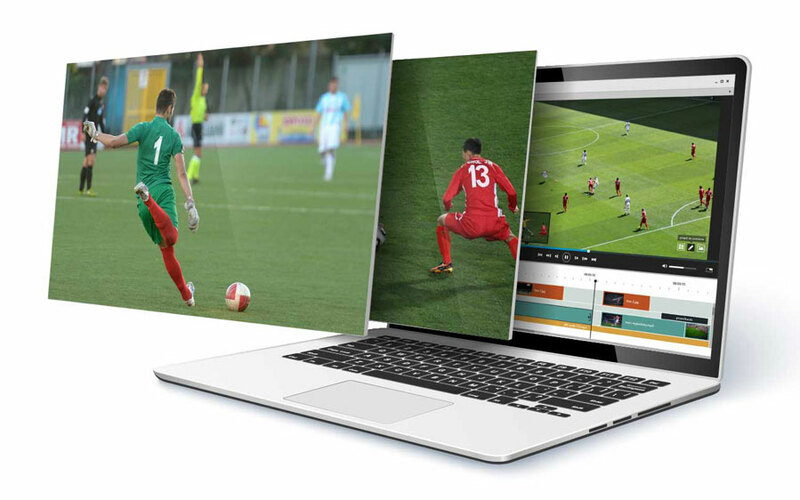 In the SportLiveTag system, video analysis consists in marking events, games and players behavior. Thanks to the mechanism used in the system, you tag the action with one click, and at the same time cut it as a video element into your action base. In addition, each tag assigned to the competitor generates a statistical analysis of his behavior! Thanks to the possibility of drawing through the video, you will analyze the player`s play more closely. Present it to him in the form of a graphical analysis, and certainly it will be absorbed faster! Make your own video presentations! Combine the cut actions, add graphics to the analysis, place the music or your own commentary and save it to your computer as an mp4 file. 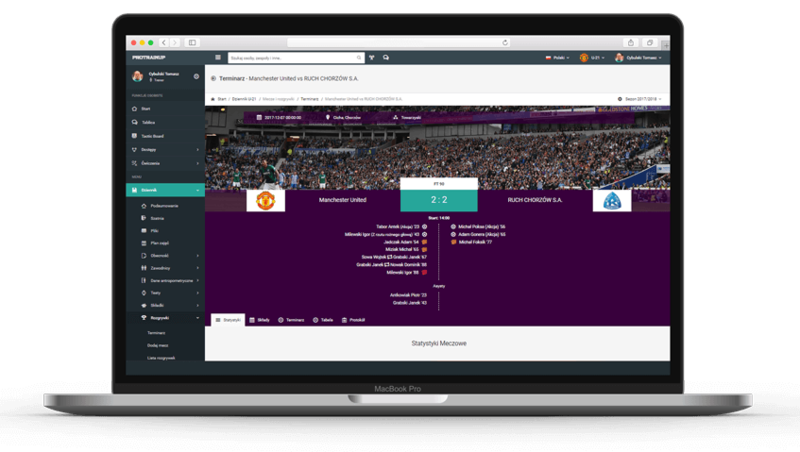 The prepared analysis can be displayed to your players on pre-match briefing or made available on social media! Register in our system, confirm registration by clicking the activation link, which you will receive on the e-mail. You can have several different roles in the system. They are: President, Coordinator, Coach, Assistant, Player and Parent.